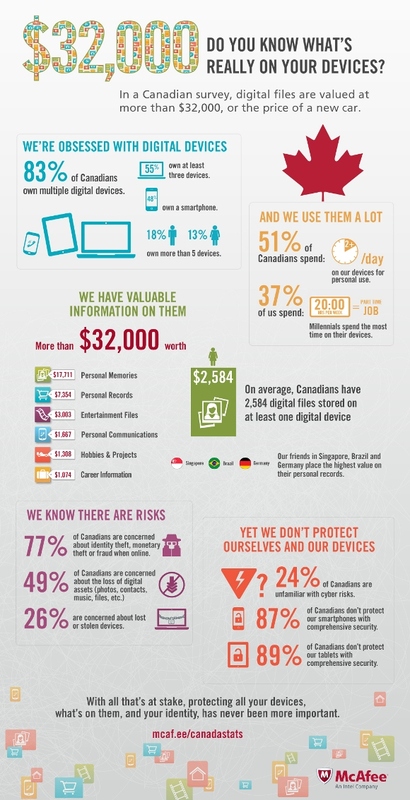 Canadians love their digital devices. And we have a lot of them. A new study released by security vendor McAfee looking at the online surfing habits of Canadians, and our attitudes towards Web security and data protection, found that 34 per cent of Canadian households own five or more Internet-enabled devices, and 51 per cent of Canadian consumers spend at least 15 hours a week using their devices for personal reasons. McAfee said Canadian consumers place a value of $32,000 on the digital assets stored on their devices, and 51 per cent of those assets are considered impossible to restore if lost. That puts our data and risk, and the study also found that, while we’re aware of the risks, most of us aren’t adequately protecting our devices today. In response, McAfee has launched McAfee LiveSafe service, an unlimited cross-device security service using facial and voice recognition to confirm user identity. Drawing in technology from parent company Intel, McAfee LiveSafe offers unlimited device security for PCs, Macs, smartphones and tablets against viruses, malware and spam. A cloud-based “safety deposit box” lets users store sensitive documents, and can be accessed by biometric authentication using voice, face and device recognition technologies. The service also includes simplified password management, remote wipe, and customer support. McAfee LiveSafe will be available in July 2013 for $19.99 for a 12 month subscription when buying a select new PC or tablet, or $79.99 for your existing devices.